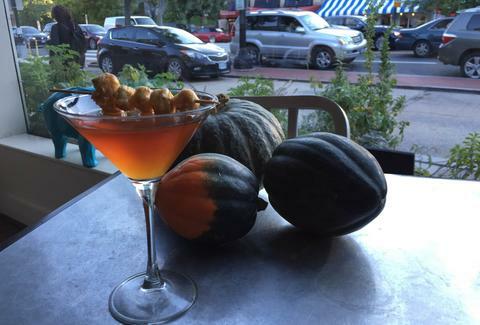 District bartenders have been meditating on how to capture fall in cocktail form without going too overboard on the pumpkin thing, and fortunately for us they’ve knocked it out of the park. 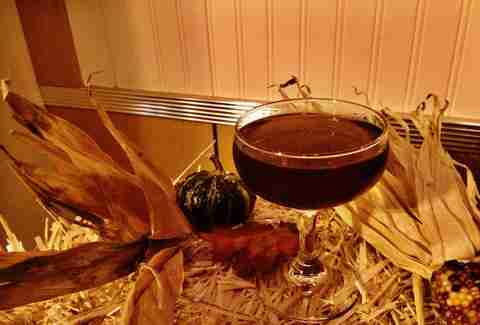 This is your cheat sheet to the 16 best fall sippers in the city. Try them before a nip in the air dictates the change to nog and peppermint everything. If fall reminds you of hitting up a county fair, you probably remember coming home with sticky fingers from pillaging a bag of caramel corn, not to mention Batman face paint. That’s what Ripple’s Caroline Blundell is trying to capture with her fall concoction “The Maize Rummer” made with buttered popcorn syrup, white and dark rum, Cardamaro, and Bittermens Xocolatl Mole bitters. There’s a sweet skewer of popcorn serving as the garnish, for those who like things literal. We didn’t want to play the pumpkin track on repeat, so we limited ourselves to including only the best gourd-forward cocktail: a smoked pumpkin Old Fashioned at Del Campo combining Bulleit bourbon, house-made pumpkin cordial, Angostura bitters, and a charred pumpkin ball garnish. The smoking occurs tableside over flaming cinnamon, so at least you get some drama and envious stares from nearby diners for your $15. A hard day’s work goes into this corn maze in a bottle. Mandu’s beverage director Phil Anova coats corn with the stuff dreams are made of (butter, salt, nutmeg, and honey) and slow cooks it on the grill before tossing it straight onto the coals for more charred flavor. Once stripped off the cob, the corn, plus some sliced leeks are introduced to the soju and left to rest for a couple of days. 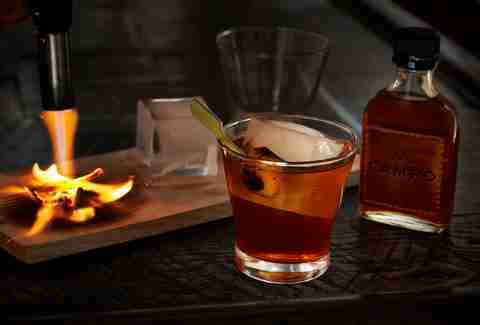 What results is a sweet and savory gulp that’s sweet from the honey and smoky from the grill. Try it by the bottle with friends for $20. Oktoberfest may be a fuzzy memory by this point, but your season of drinking from a boot doesn’t have to end thanks to Tico’s aptly named Made for Selfies. You’re at Tico, remember, so obviously tequila is the lead actor, but there are some surprises in there including Drambuie, five-spiced pomegranate, orange, lemon, cardamom bitters, and even a little Belgian ale for fizz. Just try not to sing that airwaves-amputating song by The Chainsmokers. Apple cider: it’s been done. 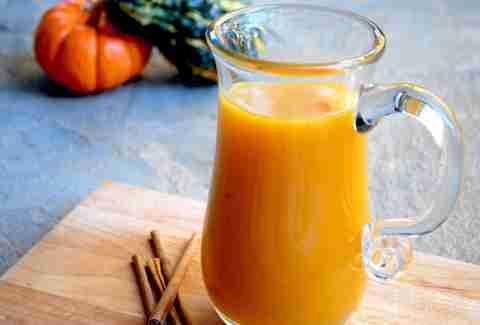 But, what about apple and butternut squash cider? Now that’s something to wrap your newly gloved hand around. Try the AppleJack brandy-spiked potion that’s steeped with cinnamon, cloves, star anise, peppercorns, and nutmeg at the RW Restaurant Group's restaurants including Brasserie Beck, Mussel Bar & Grille, Wildwood Kitchen, Villain & Saint and beyond. Wait, we almost forgot the part where the magic happens. Once the cider is nice and warm, bartenders pour it over house-made citrus compound butter. Southern Efficiency bartender Paul Taylor says his inspiration for this bad boy was musical: the slow tempo and cadence of Patsy Cline’s 1961 song “I Fall to Pieces” is mirrored in the drink, which should be enjoyed slowly. 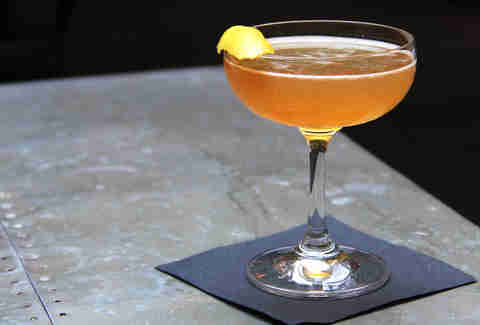 Perhaps that’s because it’s pretty boozy thanks to both Laird’s apple brandy and Rittenhouse rye. 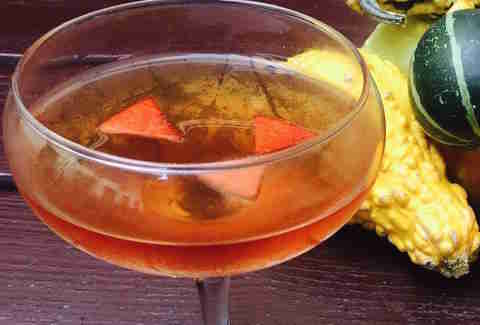 Also in Paul’s cocktail: Cocchi Vermouth di Torino, Amaro Averna, and Angostura bitters. You should taste fall flavors like apple, baking spices, and vanilla. All bartender Julien-Pierre Bourgon needs to bring a smoking tempest of a cocktail to your table at Masseria is a little camper burner and a small Turkish coffee pot. That’s because the black walnut-infused glycerin smoke has a very low smoke temperature. It swirls in a snifter holding Hennessy VS cognac, Angostura bitters, and DC’s own Don Ciccio & Figli nocino, which is made with black walnuts. In order to make sure the fall-smelling smoke makes it to your table, Bourgon traps it with a black-linen coaster. Expect it to taste a little like a clementine made hedgehog-like in appearance using cloves -- a craft you may have completed at Christmas. There’s no high-proof spirit leading the charge in this fall charmer, making it surprisingly light. It could even be a session cocktail should you fall (!) in love with it. Must be that whole low-alcohol cocktail trend setting in. 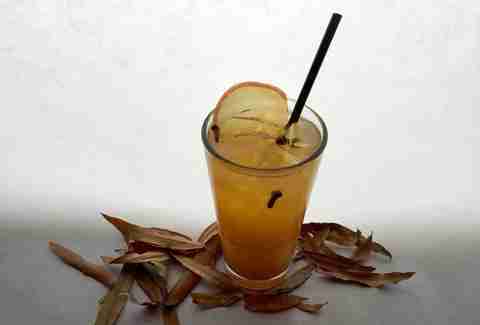 Instead of gin, whiskey, or rum, the Fallen Leaf contains only an Italian amaro called Punt e Mes, allspice dram, Nux Alpina walnut liqueur, lemon, and hard cider. It’s nutty and fizzy without being sweet. The warmth radiating off Bourbon Steak’s beloved buttered rum basically mandates that you drink it outside on the fire pit-equipped patio with one of those faux fur blankets wrapped around you on your first date. After browning butter, the bar team adds cinnamon sticks, allspice, star anise, sliced ginger, cloves, and vanilla and lets the mixture steep before adding brown sugar and spiking it with dark and light rum. On top is thick whipped cream and freshly grated nutmeg. It won’t lose you pounds, but it will gain you a second date. Meletto means orchard in Italian, so it’s a safe bet the Meletto #3 contains some apples. Indeed, the up drink from Jeff Faile stars Daron Calvados -- an apple brandy made from tart fruit of the Pays d’Auge region of France. It’s shaken and stirred with Cardamaro (for bitter balance), cinnamon syrup, and lemon. This is the third in a series of apple-centric drinks Jeff has rolled out, hence the numeral. Major points for the name because it conjures up the image of a rather adorable meme. The Flannel Pig, so named for the Pig’s Nose blended Scotch that leads the charge also includes Dolin Génépy, an Alpine French liqueur, and Alexandro Moscatel Dulce sherry from where else but Spain. 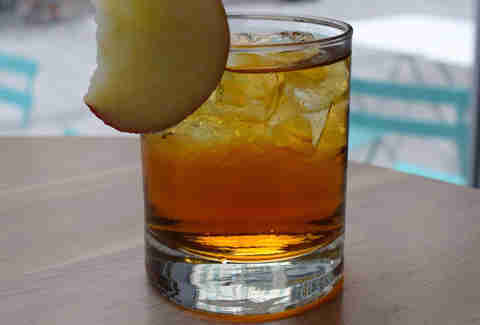 Garnishing this bad boy are slices of Angostura-soaked apples. Unlike that half pour of a Manhattan you get on 14th Street, this cocktail is well worth its $12 price tag, given the blended Scotch and somewhat esoteric ingredients. For those still stuck on the secondary educational hamster wheel, fall still free associates as back to school season. That’s why you’ve been craving mom’s PB&J. 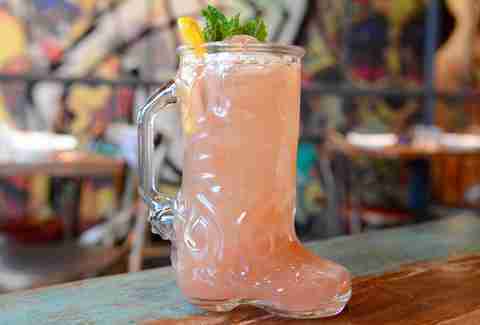 We can’t help you get one of those, but how about an adult, glass-bound version at Succotash? The new restaurant swirls Bulleit bourbon, oloroso sherry, peanut potlikker, ‘Bama grape jelly, egg whites, and salty peanuts. What’s peanut potlikker you ask? The savory liquid left behind after boiling peanuts. This light and bright sipper is how you’re starting a meal at Centrolina. 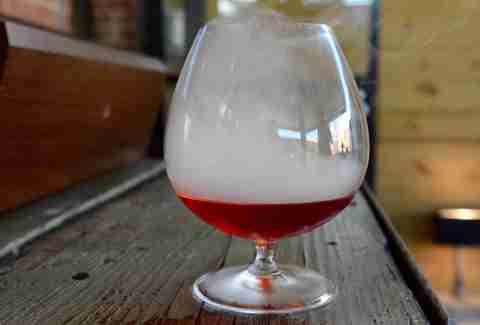 Amaro Montenegro counteracts any sweetness from the Foggy Ridge cider and Bluecoat barrel-aged gin brings the buzz. The Amaro Montenegro is lighter than other amaro styles and brings baking spice notes like cloves, cinnamon, and orange peel. Props to the bar team for using a sparkling cider from Virginia. 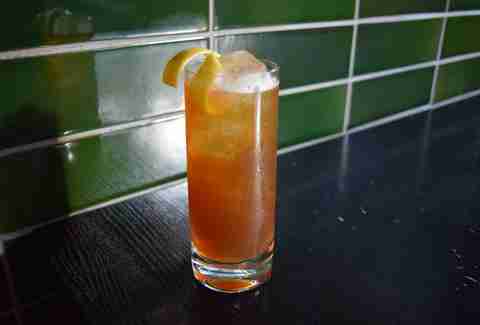 If you’ve got the blues, demand a Fall Pimm’s Cup at 2 Birds 1 Stone. 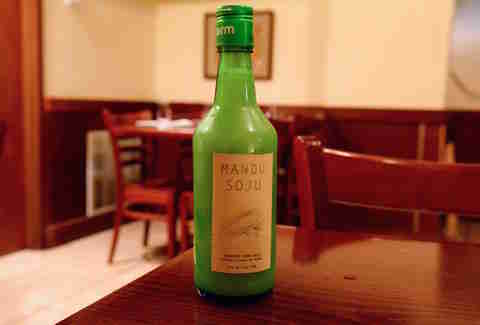 The house-made ginger beer that burns in the best way can cure anything from NFL woes to the common cold. 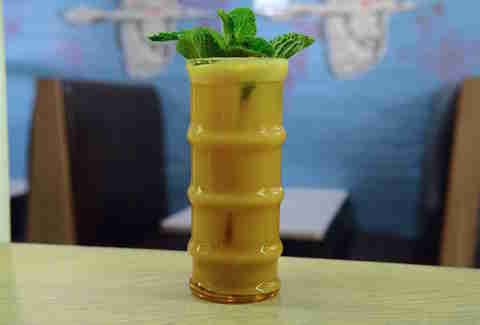 The soda is the base of the warming cocktail that also contains cinnamon-infused Pimm’s and gin. It was so popular last year, it’s making an encore and no one’s complaining. Boundary Stone offers a wallet-friendly ($10) fall cocktail in the form of cinnamon- and clove-infused J.P. Wiser's Canadian rye whiskey, cold-pressed apple cider from Earth N Eats farm, and a shaved apple garnish. 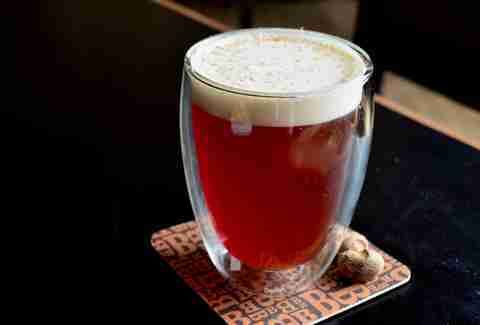 It’s a serious upgrade over any spiked cider attempts you may have undertaken. 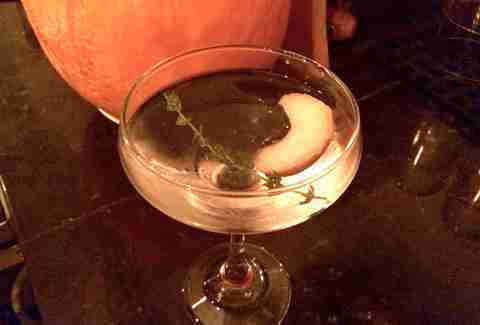 If Johnny Appleseed and Jessica Rabbit had a booze baby, it would be Garrison’s Jessica Appleseed. While that may be true, the drink is actually named for Jessica Moyer, the bartender who created the tangy martini-like concoction. House-pickled honeycrisp apples from Path Valley Farms make the drink otherwise composed of gin or vodka and spiced Dolin blanc stand out. You’ll order a second, surest bet in Vegas. Laura Hayes is a DC-based food, drink & travel writer who also contributes to Washington City Paper, Food Network, Edible DC, and others. She's just about had it with pumpkin everything. Follow her @BTMenu.